I wanted to write this down before I forgot it. 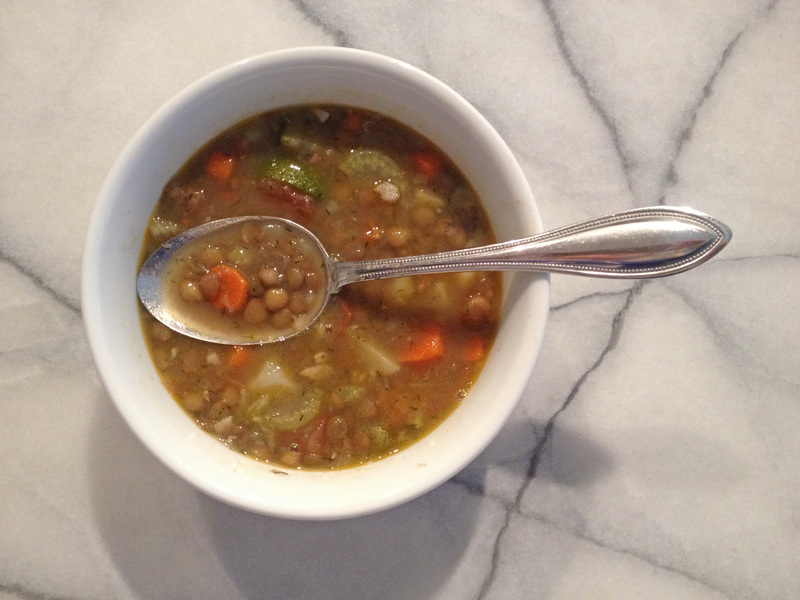 Lentil soup can be super bland and boring but this one is really good! 1. Put olive oil in stockpot over medium-high heat. Once heated, add all veggies except garlic. Stir for a few minutes. Add lentils, garlic, dill, salt, and pepper and cook a few more minutes until fragrant. 2. Add broth, bring to a boil, then reduce heat and simmer for 40-50 minutes until lentils are tender. I used to always just steam broccoli. Then one day someone suggested I roast it. Whaaaaaaat? Ok. With some olive oil and some garlic. Sounds good, right? But once I got started doing it differently, I couldn’t stop, so I also added some herbs, chili paste, and soy sauce. OMG so good. So, how do you make it, exactly? 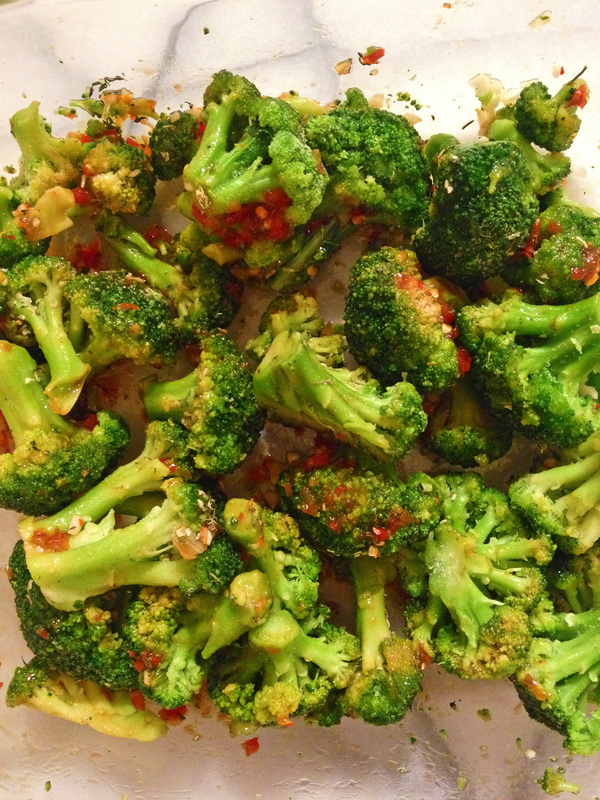 I use frozen broccoli, put it into a baking dish, coat it with olive oil (I like a LOT of olive oil), add one or two cloves of chopped garlic, a sprinkle of my favorite herb blend, a teaspoon of chili paste, and a tablespoon of soy sauce. I roast it in a 400 degree oven for 20- 30 minutes. I like it crispy and roasty, you can cook it shorter or longer depending on how you like it. You may never make broccoli any other way after this! Mmmmmmmm, Autumn! Pumpkins, cinnamon, oranges and yellows. And APPLES! So many apples. What to do with them all? Especially if you have some that aren’t as crisp and juicy as you’d like for eating? Make applesauce! 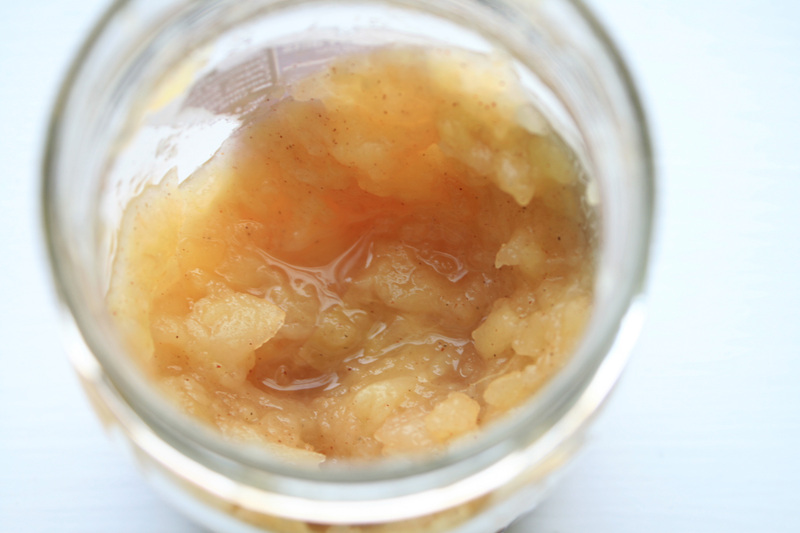 Applesauce is suuuuuper easy to make. Just take 5 or more apples, peel them, slice them into bite-sized pieces, put them in a saucepan with a little bit of water, sugar, and cinnamon (optional). Bring to a boil, then reduce to a simmer. Stir often and mash them up with the back of the spoon or a potato masher. Let it cool, then transfer it to a jar- it will keep for about a week. I put it into oatmeal in the morning. Yum! What do you do with applesauce besides eat it plain? Eggs! There are sooooo many ways to make eggs, you could have them every Monday and not get tired of them. Plus they’re fast to make, and healthy, too. 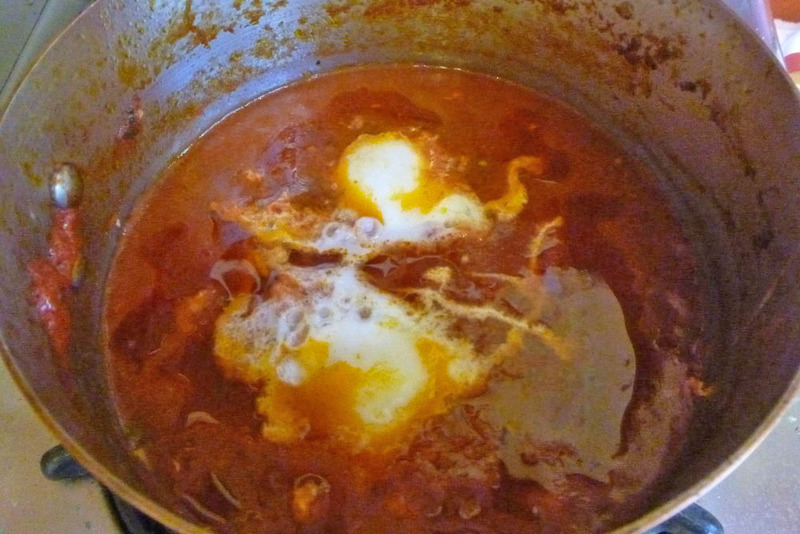 Eggs In Hell (sometimes called Eggs In Purgatory): Basically eggs poached in marinara sauce. You can used jarred sauce, or make your own. You can even add other things like bacon (which makes it not Meatless Monday- maybe Meaty Friday or something instead). This makes a great breakfast, lunch or dinner. 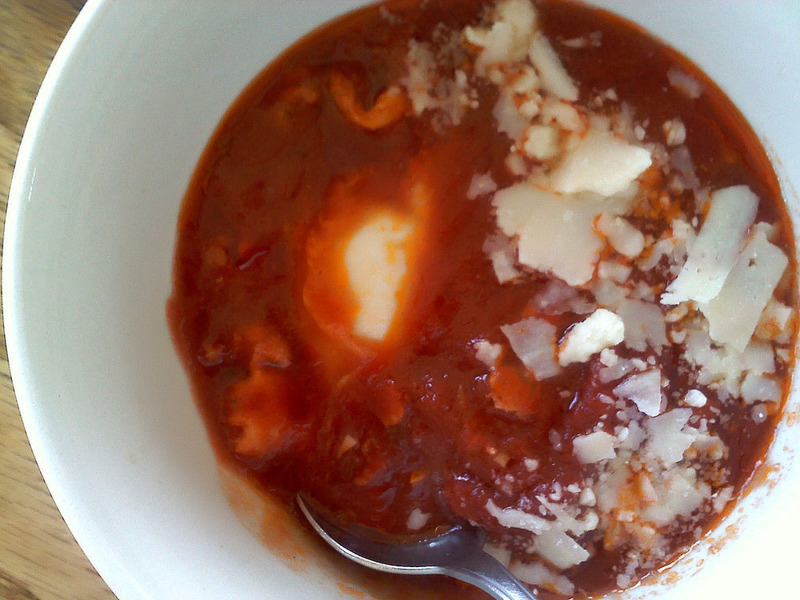 Poaching eggs in tomato sauce is really easy and so delicious. It’s pretty easy, you just poach some eggs in some marinara sauce, then top it with some cheese. If you need a recipe, try one of these! How do you make toasted bread crumbs for salads? I love toasted bread crumbs on salads. They add a sort of oldey timey restaurant fanciness, a nice crunch, and some added texture to what can sometimes be boring salads. They are a good substitution for bacon bits (it’s true!) because of the crunch factor. They’re easier to make and easier to eat than croutons and I like them better. I always keep small pieces of stale bread, too small to do anything with pieces, and the ends of store bought loaves in a bag in the freezer. When I want to make bread crumbs I take a couple pieces out, microwave them for about 20 seconds to defrost them, and put them in the food processor for a few spins. To make toasted bread crumbs I heat up a swirl of olive oil in a skillet, add the crumbs in a single layer, add a minced clove of garlic and maybe some dried herbs- I like a basic Italian seasoning. I cook them on medium, stirring the whole time (they burn easily). As soon as they smell nice and are golden brown I remove the pan from the heat and remove the bread crumbs from the pan (they will still cook in the hot pan and might burn). I let them cool off a little then add them to salads. You could also use them in soups. They keep for up to a week in the fridge and a couple of slices of bread will make enough for 4 or 5 salad servings. I’m super into these toasted bread crumbs now but aside from salads and soups, where else can I use them?? 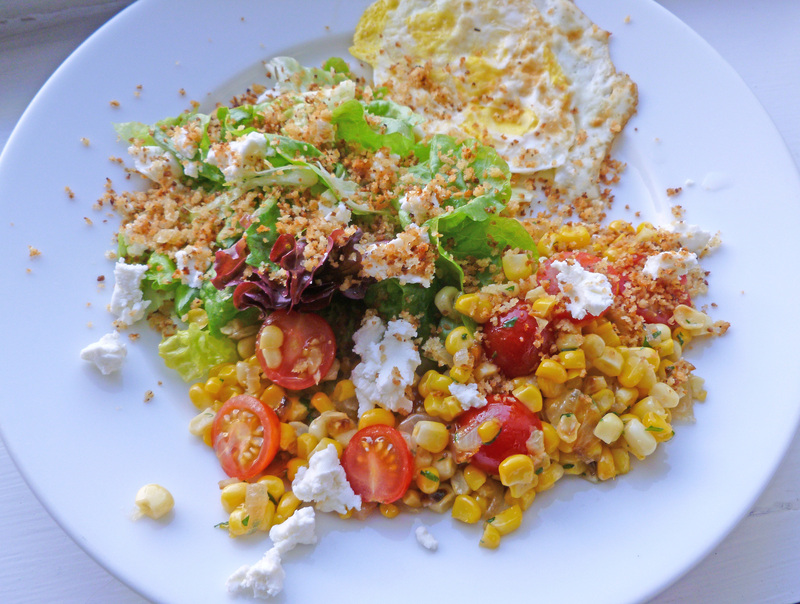 Toasted bread crumbs make a delicious topping for salads.